The evening I hope I will never forget on Olkhon makes a beautiful picture in my mind’s eye. As the sun goes down over the other side of the mountains, five of us sit on the beach, holding on to cups filled with tea, munching on biscuits, talking and laughing. The figures in my mental picture are Luke, Paul, Emma and Nikolai. 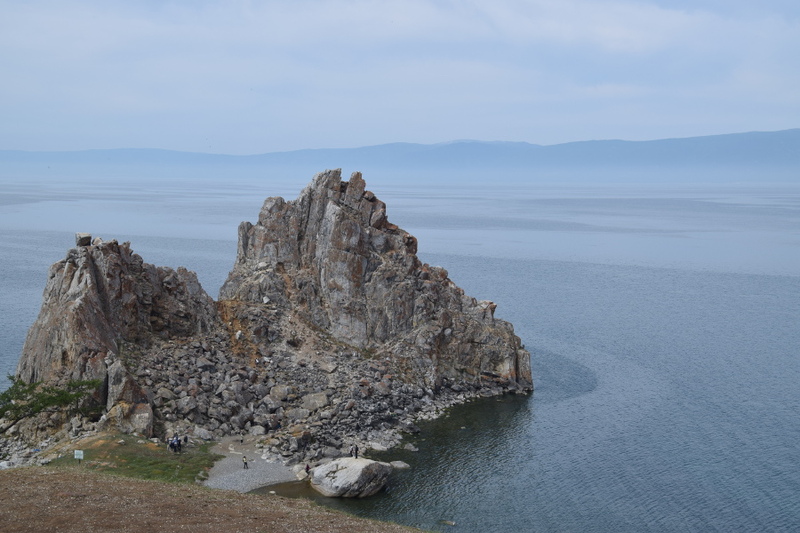 Luke and I met Emma and Paul on the way up to Olkhon Island on the bus. The English/Irish couple was travelling through Russia and Mongolia, taking several days break to enjoy the island and stay in a homestay which advertised the fact that they have several large sled-dogs which the visitors are welcome to play with. Paul was especially excited that the dogs had recently had puppies, and we were slightly jealous that they got to spend so much time with the little fur balls. This evening the two came of them came by while walking the dogs and completed our odd group on the beach. We had picked up our final character completely by chance. Outside of the supermarket, a Russian stopped us. He was also wearing an Osprey bag, and gestured at us- ‘same rucksack!’, enthusiastically asking us where we are from. Nikolai (the Russian) we had just arrived and was looking for the campsite, and in our limited conversation we discussed where the campsite was, the fact that we had the same brand of backpacks, and that he worked in a hydroelectric plant near Krasnoyarsk. It’s a place that has come up frequently in our conversations with others, a location where other nature lovers have gotten off to do a spot of rock climbing or hiking and staring at rock formations. A spot we’ll have to mentally put on the ‘next time’ list. 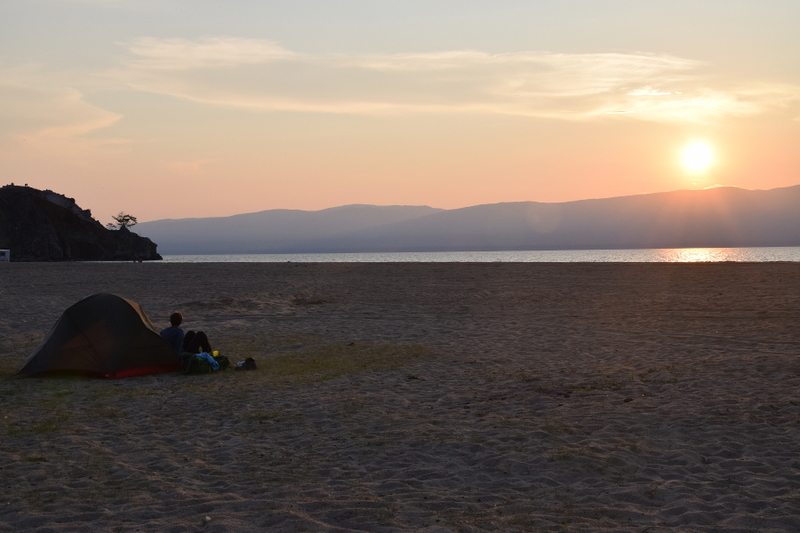 Instead of leaving us when we reached the beach, like we expected, he helped us choose a place to pitch our tent, helped us put it up while making approving noises, and then shared a snack, watching the lake’s waves coming up to the shore. He was an interesting guy doing a solo trip, planning to walk the same route we had just returned from. His tent, he said sadly, was twice the weight of ours. That means that each of us usually carries a quarter of the weight that he was carrying for the tent alone. We pitied him, although he didn’t seem to be too bothered. He went for a swim in the cold waters, watched with interest as we cooked a meal which featured a little bit of everything, and ate his smoked fish. Although there were long breaks between our conversations, and sometimes these are laboured and need to be repeated several times, we’d made a friend for the evening. When the other two arrived, the three of us sprang into action- as if we were hosting a dinner party. Nikolai brewed tea, I pulled out the biscuits, Luke organised seating on roll mats. Nikolai even procured a sleeping bag/blanket to warm our guest when it got colder. And then we spent several hours talking, from everything about Emma and Paul’s time in Krasnoyarsk, where they discussed the hiking and climbing with Nikolai, to our experiences on the island. We talked about our languages, explaining that ‘biscuit’ was, in this case, a synonym for a cookie, and learning more about the root of the word ‘иностранец’ (foreigner) and how to conjugate it. We ate all of the cookies and needed to make more tea as the hours passed in a happy calm company. If any of you stumble upon this- thank you guys, so much, for the best evening we had in Russia.